I decided to try one of those DIY spray foam insulation kits to help insulate the heck out of my basement. One of the recommendations from a friend on Facebook said to "make sure you cover everything - including hair". 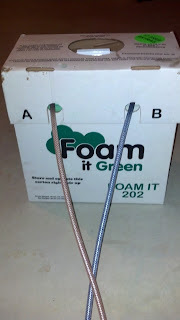 I decided to choose the spry foam insulation kit from http://www.sprayfoamdirect.com/. The seemed to have a similar kit to many others and their warehouse was only a few miles from our house, which meant we could pick it up and save some shipping costs. I decided to use their spray foam 102 kit, since I only needed to do about 60 square feet of rim joist insulation. They have a good video showing the rim joist spray insulation process on their website. I should have know better and ended up buying the 202 kit to finish the job, probably because I put it on thicker and also made sure the area was well covered. There were a lot of tools on their website to understand the process and estimate how much foam I needed.